They’re evidence of extraterrestrial visitation, time travelers or lost civilizations like Atlantis – or perhaps they’re here to show us that some ancient peoples were far more advanced than we think. 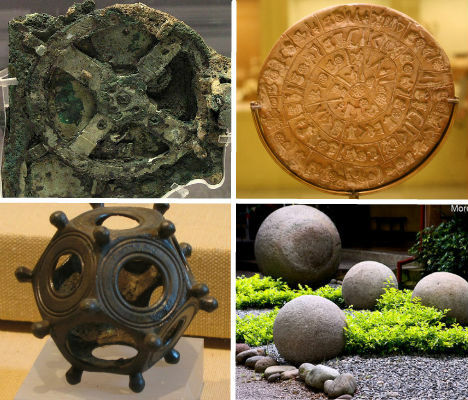 It’s hard not to get caught up in the mystery and intrigue of these puzzling and often bizarre ancient objects, most of which simply can’t be explained by modern science. There’s very little that we actually know for sure about the Phaistos Disc. It’s made of clay – check. It dates back to the second millenium B.C.E. – maybe. But its origin, meaning and purpose remain shrouded in mystery. Discovered in Crete, the disc is features i241 impressions of 45 distinct symbols, some of which are easily identifiable as people, tools, plants and animals. But because nothing else like it from the same time period has ever been found, archaelogists haven’t been able to provide a meaningful analysis of its content. Is the Voynich Manuscript evidence of a forgotten civilization, or merely an elaborate hoax? This handwritten book full of text that the world’s top cryptographers and codebreakers have never been able to decipher dates to the 15th century and was discovered in 1912 by book dealer Wilfrid M. Voynich. If it is a hoax, it’s incredibly convincing, given how fluidly the text was written and the fact that statistical analysis has revealed patterns similar to those found in natural languages. A linen cloth bearing the barely-visible image of a man with apparent crucifixion wounds became the center of both devotion and controversy when it was first discovered in the Middle Ages. Could this be the burial shroud of Jesus Christ? Radio carbon dating puts the origin of the shroud between 1260 C.E. and 1390 C.E., consistent with the theory that it was a forgery. But the results have been disputed and since then, a wide range of modern tests have been unable to explain the markings on the cloth. When a spark plug was found encased inside a 500,000-year-old lump of hard rock, self-professed paranormal investigators decided there were three possibilities for how it got there: A, it was created by an extremely advanced ancient civilization (maybe Atlantis? ), B, aliens visited the earth during the time of dinosaurs or C, time travelers from the future left clues in the distant past. All three explanations are highly unlikely to say the least, but scientists haven’t been able to come up with a better explanation – probably due to the fact that the Coso Artifact has mysteriously disappeared and is thus unavailable for analysis. When a genuine Norse coin dating to the early 11th century was found among Native American ruins in Maine in 1957, it seemed to offer an intriguing piece of evidence that Vikings did indeed travel further south than Newfoundland long before the time of Christopher Columbus. And it could be so – but experts have their doubts. The fact that the ‘Maine Penny‘ was the only Norse artifact found at the site seems to indicate that it came to the site through native trade channels from Viking sources in Labrador and Newfoundland.